The Listen and select Multimedia Interactive Learning Application (MILA) generates a simple, intuitive game whereby learners listen to the audio and select the corresponding image from a choice of four. Learners have as many attempts as they need to find the correct answer and hear the correct corresponding phrase or sentence for each image as they do so. The order of the four images is always randomised and the overall order of the correct images and distractor images is always shuffled so that no two games ever follow the same sequence, while at the same time ensuring that every image as the correct choice once only. 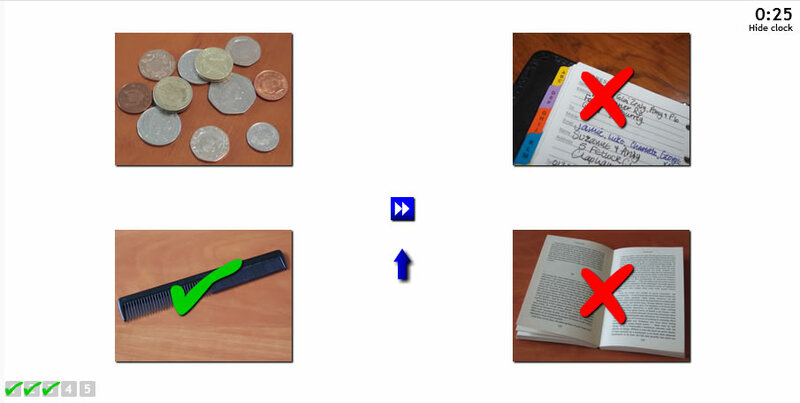 This approach is often refered to as Total Physical Response (TPR) where learners demonstrate that they understand by responding to language through physical (non-linguistic) action, in this case clicking on the correct image. One possible scenario is to create a set of corresponding images and audio for a person’s daily routine, e.g. “Every morning, I get up at seven o’clock”, “I brush my teeth”, “I have a shower”, “I get dressed”, etc. Learners will listen to all the example expressions, e.g. “I brush my teeth” only as often as is necessary for them to remember the meaning against the corresponding image. Once they understand an expression, they will no longer select incorrect images.